In respect of international shipping from the USA using a sea freight service, LCL is an abbreviation for 'Less than Container Load'. This international shipping term is commonly used to describe an international sea freight service that designed to ship boxes, crates or pallets from the USA that cannot fill an entire 20 or 40-foot sea freight container. LCL is the most economical way to ship boxes, crates or pallets if you do not want to load and pay for the full container like you, do with FCL sea freight service. If this is a commercial freight, you are shipping boxes, crates or pallets from the USA overseas and your overall shipping volume is considerable small, i.e. does not exceed 15-20 cubic meters, then there are many advantages on using LCL sea freight service on your international shipping from USA VS. using FCL (Full Container Load ocean freight service). If you are shipping from USA Household Goods or Personal effects in boxes, crates or pallets, then there are many advantages to use LCL ocean freight service VS. using sea freight service offered by international moving companies. Inexperienced, first-time international shippers should read this article related to shipping household goods from the USA overseas or moving from the USA overseas. When you share a 40-foot sea freight container on shipping boxes, crates, and pallets from the USA with a number of exporters, YOU PAY ONLY FOR THE SPACE USED IN THE CONTAINER, BUT NOT FOR THE ENTIRE CONTAINER. Then it obviously more cost-effective compared to international shipping FCL freight (Full Container Load). Typically international LCL sea freight rates are calculated is by volume (per cubic meter/cubic foot) but by weight. Since cargo vessels capacity is not in fact limited by weight of cargo but by hold of ship, then in general WEIGHT IN LCL SHIPPING IS NOT A PRICING FACTOR but the overall volume of shipping goods only (you may find more about dimensional weight in ocean freight and inland (LTL) trucking in our website). If you ship LCL then YOU MAY SAVE ON INLAND TRUCKING. If you self-deliver your shipping boxed, crates or pallets, which can easily fit into your own or rented truck, to a freight terminal, then you will eliminate pre-carriage expenses that are pretty high in your total shipping cost. Pre-carriage expenses on international shipping freight from the USA may even exceed the actual ocean freight itself. Note: In shipping cargo from the USA using LCL, the term Ocean Freight means the price paid for cargo transfer (sailing) between international ocean freight carrier's terminals (called CFS - Container Freight Stations) in countries of origin and destinations. OCEAN FREIGHT IN INTERNATIONAL SHIPPING CARGO FROM USA DOES NOT INCLUDE COST OF PRE-CARRIAGE, ORIGIN AND OR DESTINATION CHARGES. 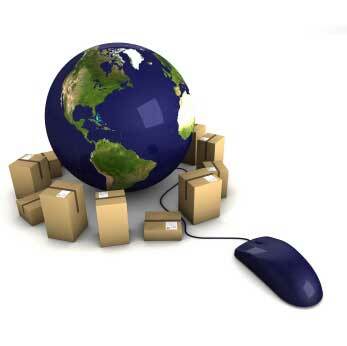 See samples of total shipping costs calculations on Import or Export to or from the USA below. If you self-deliver your shipping boxes, crates or pallets to an international shipping company's ocean freight shipping terminal (CFS), then you may request to palletize your loose boxes into one or more shipping units at the shipping freight terminal. 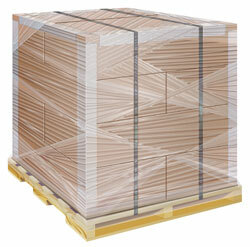 By palletizing your boxes you make it safe for the international shipping from the USA. IT MUCH EASY TO HANDLE SMALL SHIPPING BOXES THAN HEAVY PALLETS. You may palletize smaller shipping boxes and request to ship bigger items lose. Then you can eliminate shipping cost and extra-volume charges related to the palletizing. (you may find more about palletizing on shipping cargo from the USA on our website). Note: International moving companies will box, crate and palletize your goods. However, international moving companies will charge you for the labor, materials etc on top of actual international shipping cost. NO FOOD STUFF, WINE & DRUGS: Shipping of foodstuffs including wine and drugs, including perishable food items, edible animal byproducts, supplements, etc in shipping cargo from the USA are subject to detailed regulations. Violations of these regulations can result in detention, confiscation, or destruction of cargo, as well as fines and criminal charges. Responsibility for proper documents, permits, and incurred charges are for the account of the shipper/consignee. If you pack in used boxes, erase all former shipping labels and marks. Especially if it relates to dangerous goods or hazardous materials. Any motorized vehicle that requires DMV (U.S. Department of Motor Vehicles) registration (auto, motorcycles, mopeds, jet skis, ATV’s) will not be permitted to shipping from the USA as LCL freight. This is due to US Customs Regulations that will not recognize any ocean freight carrier's warehouse as an exam site for inspection. You can ship motorized vehicle using sea freight service for shipping vehicles in containers or Ro-Ro, but LCL. 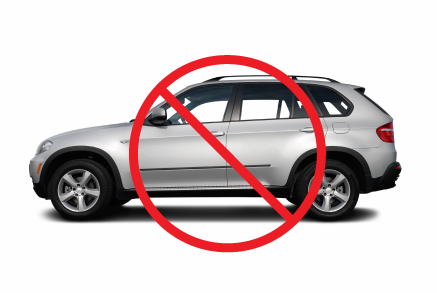 Freight cost per a motorized vehicle should be equal to freight cost on shipping for the USA a mid-size car, but always must be re-confirmed upon a booking request. FYI: If shipping from USA motorcycles using FCL freight service, then it may approximately fit up to: 8 motorcycles per 20' FCL sea freight container and 18 per 40'. Shipping motor parts that may contain any fluids (such as engines, tanks, etc) is subject to the following requirement: ALL FLUIDS MUST BE COMPLETELY DRAINED. LARGE AND HEAVY PARTS MUST BE CRATED OR SECURE ATTACHED TO PALLETS. However, in respect of shipping freight from the USA overseas, even drained motor parts (dry batteries) may be considered dangerous goods. If motor parts are considered dangerous goods by the steamship line, then additional documents related to shipping dangerous goods must be provided and hazardous surcharges apply. Shipping dangerous goods must be approved at a time of booking. International transportation company should inform shipper about additional requirements and charges (if any) prior the cargo will be scheduled to the international shipping from the USA. International shippers of auto parts must be aware and accept the general conditions on shipping dangerous cargo from the USA. International ocean freight shipping rates may be ALL-IN (all-inclusive) or be subject to surcharges related to a particular origin-destination country. Surcharges in international shipping from the USA can be a percentage of ocean rates on top of ocean freight rates itself and/or lump sums added to the international ocean freight rate. Important! : Do not confuse total shipping cost on an international shipment with a sea freight quote obtained from an international shipping company. Refer to samples of calculations of total costs on shipping freight from the USA below. Export and Import. Typically international LCL sea freight quote offered by international shipping companies on EXPORT cargo from the USA includes origin charges but does not include destination charges. International ocean freight quote offered by international shipping companies on IMPORT to the USA may not include charges at the origin as well. ETT: 33 DAYS (ETT - Estimated Transit Time. The expected sailing time on shipping cargo from the USA between origin and destination CFSs. Note that ETT includes inland transportation and time to handle cargo at CFSs. In this scenario cargo will be accepted at CFS in Los Angeles, CA (U.S. West Coast), then transported by land to U.S. East Coast (let say to the port of New York) and be sailed to Europe, possible with trasshipmt via a major European seaport. BOL FEE - INTERNATIONAL SEA FREIGHT BILL OF LADING FEE USD15 per shipment - a sample of "lump sum" surcharge, which may be added to the international ocean freight rate itself. As a rule, when shipping freight from the USA, origin charges at CFS are included in the international ocean freight rate. !!! *** DESTINATION CHARGES ARE NOT INCLUDED IN INTERNATIONAL OCEAN FREIGHT RATES ***!!! Then your ALL-IN CFS-CFS international ocean freight quote on shipping cargo from the USA will be $156 per cubic meters + $15 l/sum to the total ocean freight rate. Now, let's assume that you are shipping from the USA 3.25 cubic meters of your boxes, crates or pallets. You self-deliver it to a CFS that locates in Los Angeles, CA. IMPORTANT: International sea freight rates always have minimums. Always compare an international ocean freight rate to the minimum in the initial ocean freight freight rate. You will pay the ocean freight OR the minimum, whichever is greater. Always be prepared to pay destination charges at the destination upon arrival of your ocean freight from the USA to the destination. 1. ENTRY FILING AND U.S. CUSTOMS. U.S. GOVERNMENT RELATED CHARGES - These charges include, but not limited to: (1) U.S. Customs Duties and taxes assigned by the U.S. Government; (2) U.S. Customs brokers' fees for filing entry and entry summary in the United States; (3) Other U.S. Government-related charges, which in general consist of a Customs Bond, Merchandise fee, and Harbor Maintenance Fee. These charges are payable by the consignee (recipient) directly to U.S. Customs or to his/her U.S. Customs Broker. Entry filing for international ocean freight Commercial Shipments - $125. Entry filing for intrnational ocean freight Personal Shipments depends on the complexity of shipping documents submitted to a shipment and may vary from $195 to $350 or more. However, as long as it is an informal entry, it will not require Customs Bond. Single entry Customs Bond (for formal entries. Apply to international ocean freight Commercial Shipments) - $75 or $7.00 per $1,000 of value + duty. Applies if the importer does not have a Continuous Bond on file with US Customs. (+250% when entry is processed thru another government agency, FDA, USDA, EPA, etc). U.S. Customs Duty depending on commodity if not exempt from paying duty. Filing additional tariffs (Harmonized codes) - $7 per HTS tariff after two. Merchandise processing fee – 0.21% of value. Minimum $25; Maximum $485. Applies to all imports except temporary imports. Harbor Maintenance Fee – 0.125% of value. Applies to all international ocean freight imports. These charges vary depending on commodity, weight and volume. These charges are payable to the destination station (CFS - Container Freight Station, international ocean freight carrier's receiving terminal). International ocean freight carrier's destination agent release fee - $55-95. If the destination agent is a CFS itself, then this charge can be included in a Port of entry CFS release. Messenger fee - $25-55. Covers express mail for payments and shipping documents transfers in order to get an entry and entry summary within a time slot allowed by U.S. Customs – no longer than in 15 working days. Place of Delivery warehouse release fee (if Immediate Transportation. I.e. port of entry is NOT a final destination. As a rule applies on cargo transfers to landlocked cities) - $55-105. Very important to understand that, typically, international ocean freight shipping price quots received from an international shipping company contains just a part of total shipping cost of your ocean freight shipment. Consider this example below for import freight to the USA. Notice that this rule may not apply if you are using shipping service from an international moving company. Note: In EXPORT from the USA, origin charges, as a rule, are INCLUDED in the ocean freight price quote offered by an international shipping company. *Notice: in an export of international ocean freight from the USA, origin THC - Terminal Handling Charges, Customs formalities and shipping documents turnover fees, as a rule, are included in international ocean freight rates. If you are shipping small cargo less than 0.3 cubic meters of total volume, possible using an international parcel service would be more cost-effective than a service provided by an international shipping company (freight forwarder, NVOCC or VOCC). Yes, most of the time you can use international LCL ocean freight service from an international shipping company, i.e. service offered by an international freight forwarder, NVOCC or VOCC for shipping household goods or personal belongings from and to the USA by sea. However, in order to use the international LCL ocean freight service, all your shipping items must be properly boxed or crated and labeled for shipping purpose. When wotking with an international freight forwarder, the shipper should clearly understand that he/she is responsible for description and legality of commodity and sufficiency of shipping documentats submitted to the international ocean freight shipment. Ocean freight carrier's bill of lading in international shipping using an ocean freight service is the final shipping document that acts as the title on shipped goods, as a rule, states 'SHIPPER LOAD AND COUNT' and 'SAID BY SHIPPER TO CONTAIN'. That means that the ocean freight carrier (and the international freight forwarder who represents the carrier) is NOT responsible for information provided by the shipper on his/her commodity being imported to or exported to or from the USA. An international ocean freight freight forwarder should guide shipper in the complexity of international shipment's procedures. However, it is shipper's responsibility to provide all necessary shipping documents related to his international ocean freight shipment that required by origin and destination countries officials. A. International ocean freight Bill of Lading – Ocean carriers' (international shipping company's) transport document. Title on shipped goods. Shows cargo routing, consigner, consignee, cargo description, etc. B.1. For commercial international ocean freight shipments - Commercial Invoice. Complete description of the commodity being shipped with the value in USD while using ocean freight service provided by an international ocean freight shipping company or an international moving company. B.2. For international shipping of household goods and personal belongings overseas – Valued Packing List. An inventory list with value in USD assigned to each item being shipped by an international ocean freight shipping company or an international moving company. Notice: some countriers require proforma commercial invoices for international personal shipments as well. However, having a complete Valued Packing List submitted at the origin, upon destination customs request, you will be able easy to transfer your Valued Packing List into a proforma commercial invoice required by the customs. E. Fumigation Certificate– Certification that cargo and packing materials were fumigated after cargo had been containerized and is free of infestation. F. Special Shipping Documents – Dependent on commodity and country of origin. Within several days of the arrival of your international ocean freight shipment arriving to the destination port of entry, your consignee (recipient) should receive a notification (arrival notice). As a rule, it will be an arrival notice faxed or e-mailed to the consignee by the agent of international ocean freight shipping company used on your sea freight shipment. Otherwise, it can be a phone call or mail from the international shipping company's destination agent. Make sure that contact information of consignee initially provided in your booking request and transffered to your international ocean freight bill of lading is correct and valid. Act promptly. Your free storage time at a destination warehouse is limited. Depending on destination ocean freight carrier's station policy it varies between 7 to 14 days. Thereafter storage/demurrage may increase the total shipping cost for your international ocean freight shipment dramatically. Laws allow to your consignee working on the cargo recovery directly with your destination county's customs and other parties related to your international ocean freight shipment. However, if the consignee is not familiar with import procedures on sea freight imprt or export, we recommend him immediately request the international shipping company's destination agent to complete the cargo release on your behalf or forward the notice of arrival along with other documents required by destination authorities to a freight forwarder or destination customs broker. They will charge a reasonable fee for its service. However, they should obtain customs and warehouse releases with no (or minimum) storage/demurrage charges on your international ocean freight shipment.